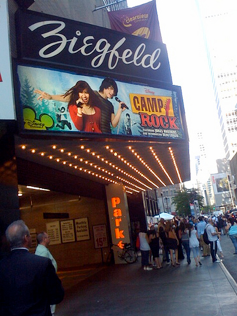 On January 25, 2008, during the commercials for Minutemen, it was announced that Camp Rock would debut June 20, 2008. Camp Rock was the second DCOM to air on ABC's The Wonderful World of Disney after its premiere on Disney Channel, and it is the first DCOM to air on ABC Family and be available online after its premiere on Disney Channel. The movie stars the Jonas Brothers and introduces Demi Lovato for her first lead role in a film. The film averaged 8.9 million viewers on the night of its premiere, making it the second highest viewed DCOM of all time behind High School Musical 2. The movie begins in the home of Mitchie Torres (Demi Lovato), an aspiring young musician who is hoping to become a professional singer ("Who Will I Be"). Mitchie wants to attend the prestigious and expensive Camp Rock, but her parents can't afford the camp. Mitchie later learns that her mother, Connie (Maria Canals Barrera) decides to take her catering business to Camp Rock, and so Mitchie can only go if she helps out in the kitchen with her mother (to which Mitchie of course agrees). When Mitchie arrives at camp, she becomes friends with Caitlyn Gellar (Alyson Stoner), Lola Scott (Aaryn Doyle), Barron (Jordan Francis), Sander (Roshon Fegan), and meets the Camp Rock diva, Tess Tyler (Meaghan Jette Martin), the daughter of pop star T.J. Tyler (Jennifer Ricci), and her so called "best friends", Margaret "Peggy Warburton" Dupree (Jasmine Richards) and Ella (Anna Maria Perez de Tagle). Meanwhile, pop star Shane Gray (Joe Jonas) is dropped off at camp by his bandmates Jason (Kevin Jonas) and Nate (Nick Jonas) because of his bad attitude ("You're the bad boy to the press right now!") and also as the limo was driving away Nate tells Shane that they told the press they would be recording with the winner of Final Jam. Later that day he's chased by fans and falls in the bushes near mess hall, he hears Mitchie singing her song "This Is Me" (though she thinks she is alone). Shane looks for her, but in vain. At an open mic concert, Mitchie listens to Lola's performance of the song, "What It Takes" and then bumps into Tess. In a desperate attempt to fit in, Mitchie lies to Tess and says that her mother is the president of Hot Tunes in China. Tess, Peggy, and Ella think that this is cool, and they invite her into their group. Mitchie arives at the kitchen to help clean up and Shane arrives, not wanting to be recognized Mitches covers her face in flour; Shane complains about not being able to go near his breakfast and says that his manager sent over his food allergie list and Mitchie calls Shane a jerk for not talking to her the right way. Shane begins a search for the girl with the voice, but he can't find her. Mitchie doesn't believe it could be her- "he's never heard me sing". Eventually, Tess finds out about Mitchie and Shane's relationship, and she also finds out about Mitchie's little secret. She exposes Mitchie after a surprise concert from Connect 3 ("Play My Music") and this breaks Shane's heart, thinking that Mitchie was only friends with Shane Gray the celebrity and that she didn't mean any of the things she said. Everyone turns against Mitchie and shuns her, except for Caitlyn. Later, Tess overhears Brown talking to Shane and finds out that Shane's girl is Mitchie, and she tries to prevent Mitchie from singing at the Final Jam so that Shane can't hear Mitchie sing and won't know that she was the girl by placing her "lost" charm bracelet between some of Mitchie's books in the kitchen and bringing Mr. Brown so that way Shane can't hear her. Her scheme works, and Caitlyn and Mitchie are banned from camp activities until the end of Final Jam. Right before Final Jam, while Tess, Peggy, and Ella where rehearsing she criticised them and Peggy dropped out of the group, followed by Ella. At Final Jam "Hasta La Vista" is performed, and when Tess sings her song, "2 Stars", she sees her mother there. During the middle of her performance, Tess sees her mother talking on her cell phone instead of listening to her daughter's performance. Hurt, Tess drops out of the competition by nearly falling off the stage to get her mom's attention and runs off the stage crying; and a last minute addition is performed by Margaret Dupree, or Peggy. After Peggy performs "Here I Am", Tess apologizes to her and Ella, also adding that she had no idea Peggy was so good. Peggy wins the Final Jam. After it is over, Mitchie performs her song "This Is Me". Shane hears the song and realizes that Mitchie is the girl, and he sings part of "Gotta Find You" in collaboration with Mitchie's song, holding hands at the end. Finally, the whole cast sings one song together, "We Rock". * Demi Lovato as Mitchie Torres: The female protagonist of the movie. She wants to become a professional singer and tries to hide her kitchen secret from her so-called "friends" Tess, Peggy, and Ella. Her parents aren't really rich so her mom takes a job as the camp cook so she can go to camp. * Joe Jonas as Shane Gray: The male protagonist of the movie. He is the lead singer of the band, Connect Three. The other two band members include Nate (Nick Jonas), and Jason (Kevin Jonas). In the beginning of the movie, he is shown to be hot-tempered and rather full of himself. Nate and Jason make Shane come back to Camp Rock, where he first began to love music. As the movie progresses, Shane hears a girl, Mitchie Torres, singing and she reminded him of the music that used to inspire him, and is tempted to find the girl behind the talented voice. He found at that the girl with the voice was Mitchie. * Meaghan Jette Martin as Tess Tyler: The female antagonist of the film. She went to Camp Rock to be "too cool" and wants to be a pop star. She is very popular but very mean to others, especially Mitchie, and even purposely blames Mitchie for stealing her charm bracelet so that she can be banned from all camp activities. But her behavior is understandable because her mom never paid attention to her when she was a kid. * Maria Canals Barrera as Connie Torres: Mitchie's mother. She is supportive of Mitchie's dreams, and got her in Camp Rock. She is the camp cook and she isn't very rich, unlike Mitchie's lies about her "fabulous life". * Alyson Stoner as Caitlyn Gellar: Mitchie's only true friend at Camp Rock. Caitlyn is the only girl who wasn't mean or rude to Mitchie. She wants to be a music producer and is constantly carrying her laptop around. She also has an intense rivalry with and, apparently, a hatred for Tess. She only sings once in the movie, for the full cast song, We Rock. * Daniel Fathers as Brown Cessario: The cool and charismatic camp director and Shane's uncle. * Julie Brown as Dee La Duke: Brown's happy-go-lucky co-camp director. * Anna Maria Perez de Tagle as Ella: One of Tess' best friends. She follows Tess around and does whatever she tells her to do, although she isn't mean like Tess. Ella is the girly girl of the mean girl clique; she's obsessed with lip gloss and nail polish. One of the reasons why she is friends with Tess is because she wants to be popular. She's also supposedly dumb, where she has a dilemma of choosing between two nail polishes of exactly the same color. * Jasmine Richards as Margaret "Peggy Warburton" Dupree: One of Tess' best friends and is part of Tess' group. She isn't cruel as Tess. She is to herself and is nice but just keeps things to herself. Other than tagging along with them, she dreams of being a famous guitarist and singer. She finally speaks up for herself for Final Jam and wins the prize. * Kevin Jonas as Jason: The lead guitarist of the band, Connect Three. He is spacey, out there, and the "airhead" of the band. Throughout the film, he asks Shane to make him a birdhouse. * Nick Jonas as Nate: The guitarist and vocalist of the band, Connect Three. He is practical, but sometimes bossy and serious towards his bandmates; he's the one who suggested Shane go to Camp Rock. * Aaryn Doyle as Lola Scott: A talented singer and rapper, who has been going to Camp Rock for a long time and becomes friends with Caitlyn, Barron, Sander, and Mitchie. * Jordan "J-Man" Francis as Barron James: A troublemaker at Camp Rock and best friend of Sander. He and Sander want to be reggaeton artists. * Roshon Fegan as Sander Loya: The best friend of Barron and camper at Camp Rock. He wants to be a reggaeton artist like Barron. * Giovanni Spina as Andy: A camper at Camp Rock who becomes friends with Barron and Sander. He wants to be a drummer. Camp Rock was first available on the subscription service Disney Channel on Demand on June 17, 2008. 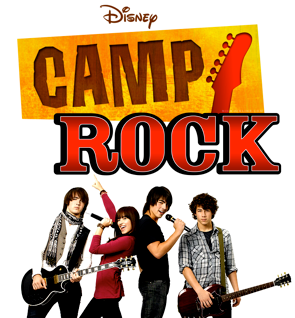 Camp Rock had its television premiere on June 20, 2008 on Disney Channel in the United States, Family (in English) and VRAK.TV (in French) in Canada. Camp Rock also premiered with a "Camp Rock Weekend" on the Disney Channel, hosted by the Jonas Brothers, Demi Lovato, Alyson Stoner, Anna Maria Perez de Tagle and Meaghan Jette Martin. On June 21, 2008 the movie premiered on ABC's Wonderful World of Disney but was hosted only by the Jonas Brothers. It also had a special Cheetah Girls behind-the-scenes segment and their "One World" music video, a sneak peek at High School Musical: Get in the Picture, and an exclusive "Making of the Jonas Brothers Burnin' Up" segment, as well as the premiere of the "Burnin' Up" music video from their new album, "A Little Bit Longer". On Monday, the uncut full-length movie will be available on Disney.com with several special features. The next Saturday, June 28, 2008, a Rock-A-Long special presentation similar to High School Musical's Sing-A-Long special presentation aired. On July 13, 2008, a behind-the-scenes look of the movie aired hosted by The Jonas Brothers. The DVD and Blu-ray release for the movie, titled Camp Rock: Extended Rock Star Edition, is planned for a release on August 19 in the United States, but not until September 26 in Australia. It will be released in November in other countries. Both the DVD and Blu-ray release will contain the following bonus features. * "Jonas Brothers: Real Life Rock Stars"
* "Too Cool: Setting The Stage"
* "Hasta La Vista: From Rehearsal To Final Jam”"
Merchandise of the movie are currently selling exclusively at Target retail stores and on Target.com. They include clothings (such as pajamas, tee shirts, and underwear), bags (tote bags, backpacks, etc), bedding collection, toys, and dolls of the characters. Play Along Toys, so far, has only released dolls of Mitchie and Shane. On May 13, 2008, Disney Press published Camp Rock: the Junior Novel, by Lucy Ruggles, the novelization of the Disney film. It has been released to some Scholastic Book Fairs beforehand already. Target retail stores currently sells "special editions" of the novel, which is a hardcover book with some more special pages including photos. A sequel to Camp Rock is planned. Disney is pending the script that's in development due to the Jonas Brothers and Demi Lovato's busy schedule. Auditions for extras will begin in July/August 2008 and the movie will be filmed at Camp Wanakita in Haliburton, Ontario and Kilcoo Camp in Minden, Ontario where the first movie was also filmed. The cast are expected to begin filming again in late spring or summer 2009. Gary Marsh, the president of the Disney Channel World, had confirmed about a sequel to Camp Rock to New York Daily News; a script is already being written for 'Camp Rock 2'. Alan Baltes, the publisher of the Acting Info blog, is reporting that pre-production for Disney Channel's Camp Rock 2 will likely get underway shortly, now that Camp Rock has aired. Actual filming would not begin until early 2009. Also, the Jonas Brothers will all share equal screen time in Camp Rock 2, and that the youngest member of the family, Frankie Jonas, will make an appearance. Demi Lovato is also set to return. According to Hollywood Reporter, all the principal cast are expected to return, with a special appearance by Frankie Jonas.